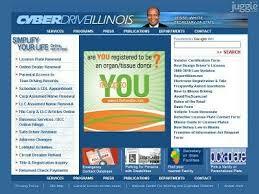 Renew your Illinois License Plate online by using www.cyberdriveillinois.com. Renewing your license plate has never been this convenient and easy! By using cyberdriveillinois.com, you will be able to renew your vehicle license plate without leaving the comforts of your home or office. As long as you have Internet connection, Cyber Drive Illinois has got you covered. What is the CyberDriveIllinois Online Service? Jesse White is the Secretary of the State of Illinois and it is the office’s responsibility to handle all vehicle registration and driver licensing concerns. Through the Cyber Drive Illinois online service, drivers can easily renew their license plates without the hassle of waiting in long lines. Moreover, the office of the Secretary of the State can manage the state records and archives more efficiently. Take advantage of the Cyber Drive Online Service today and enjoy more of your time and save your energy. The service is also very easy to use; simply follow the instructions stated below. Go on and get your license plate renewed today! First of all, you need to have access to a computer or device that has Internet connection. You also need to have your renewal notice on hand for your PIN and registration number. Take note of the name of your insurance company as well as your policy number and expiration date with them. Get your checking account or credit card number ready for payments that you need to settle online. Lastly, you have to make sure that you are not a participant of the Circuit Breaker Program. Once you have all the requirements ready, follow the instructions indicated below:On www.cyberdriveillinois.com, click on eServices link and look for ‘License Plates Renewal’ on the options provided. Take the time to read and understand the requirements indicated on the next page before clicking on the link that says ‘Renew’. Enter your registration ID and PIN number on their respective fields before clicking on ‘Continue’ to proceed with the process. Enter the information required on the next page (personal and insurance information). Choose your preferred payment method and fill up the billing information required as directed on the next page. Print a copy of your receipt and wait for your new license plate to be shipped to your address. If you have more questions about the service, you may get help from www.cyberdriveillinois.com/departments/vehicles/onlinerenewals/onlinefaq.html.